This section of the Sarasota County Water Atlas encapsulates the material discussed and presented at the Sarasota Bay Watershed Symposium which took place February 15-17 at New College in Sarasota. This content is no longer being updated, but is retained here for the information and education of interested Water Atlas visitors. 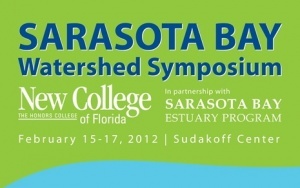 Welcome to the wiki page supporting the Sarasota Bay Watershed Symposium and Coastal Watershed Issues. A repository for content created for and during the Feb. 15-17, 2012 Symposium, the wiki is designed to grow and improve as new contributors bring their ideas and research to the forum. As new content is developed, we intend to expand this wiki to include information about all of the coastal watersheds within our Water Atlas coverage area. Those who have expertise to share on the topics of coastal and estuarine science, policy, and outreach for geographic areas outside Sarasota County — researchers with study results, citizens reporting on community projects, and educators with explanations of watershed issues, for example — are invited to contact us about including their work. Explore the wiki by finding a Topic or Place of interest, or explore in depth with Case Studies. Contribute and edit anywhere on the wiki by going to that page and clicking the Edit tab next to the Search box above. You can also Add Your Case Study. Note: To protect the site from spam, you must be logged in to edit the wiki; you can request an account during your first login. Create your own Case Study Page! This page was last modified on 4 June 2016, at 21:13.